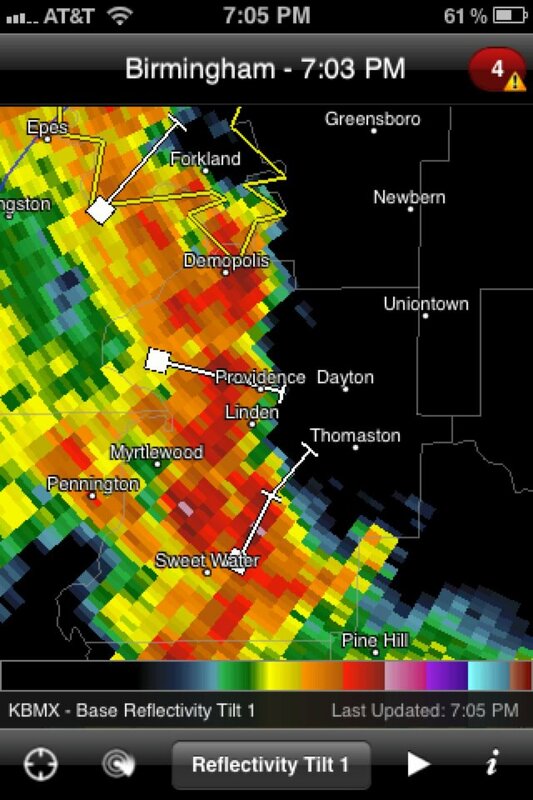 Check out this image sent from storm spotters with the UA meteorological society. 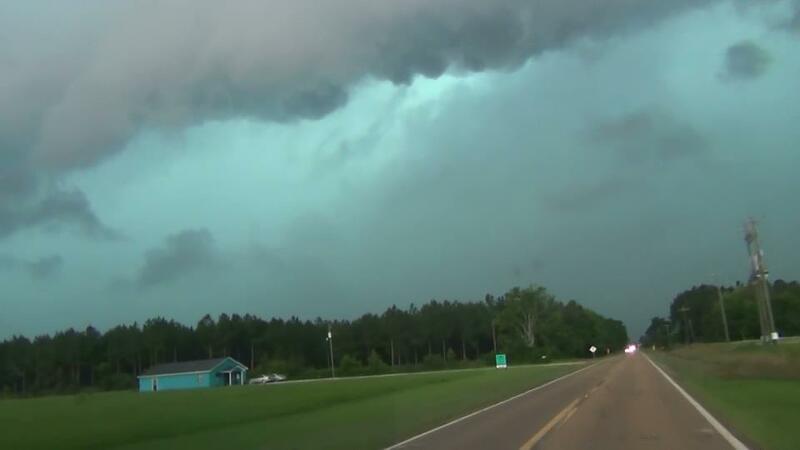 The crew was chasing a tornado warned storm in east central Mississippi this afternoon and captured the greenish look to the leading edge of the storms. This is a good indication of large hail due to scattering of sunlight in response to the hail stones. The picture was taken on HWY 80 between Chunky and Hickory, Mississippi. Send us your weather pictures! Send them to weather@wvuatv.com. Also, look us up on facebook and twitter. Like us on facebook by searching facebook.com/wvuaweather. You can find us on twitter by searching weather@wvuatv.com or WVUA-TV Weather. Great way to get weather updates! Plus, facebook is a great way to send us weather pictures. Simply tag us! We’ve been watching this storm system for days and the potential for strong to severe storms in our area. While that’s just what we saw across west Alabama, the storms didn’t really do that much. Some scattered wind damage was reported in Sumter, Greene and Marengo County, but damage reported was minor. The complex of storms weakened as they crossed the state line this evening. That being said, showers and storms will continue on and off tonight. Don’t be shocked if you get woken up by a few claps of thunder from time to time. The risk of severe weather is very low for the rest of the night as the airmass has stabilized this evening. The cold front is along the Mississippi River now and will be crossing through Alabama during the pre-dawn hours. 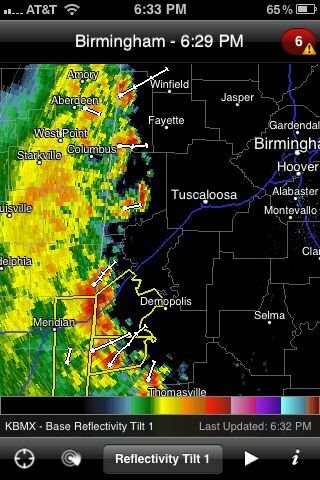 All rain and storms should be east of I-65 by 7am and out of east Alabama around lunch. We needed the rain and much of the area has picked up some nice totals out of this event. 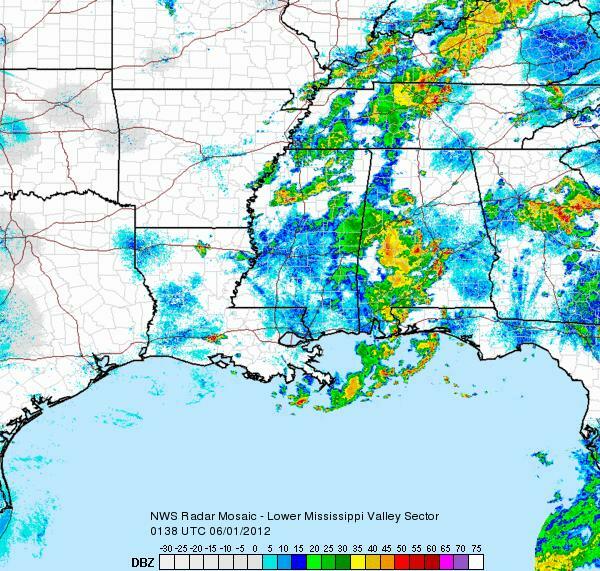 It’s nice to deal with a lack of severe weather issues and just a good ole fashioned rain event. The forecast gets nice for the next couple of days before the heat returns. Highs will only reach the lower 80s tomorrow with increasing sun during the day. Look for the risk of morning storms to move out quickly. A northwest breeze and low humidity will make conditions feel very nice. Lows will fall into the middle 50s Friday night, which will be rather cool compared to recent days. Skies will remain sunny on Saturday and Sunday. There is no risk of rain through Sunday, but that starts to change early next week. Highs will reach the lower to middle 80s on Saturday. We’re back in the lower 90s on Sunday, and humidity will gradually increase by that point. We’ll get setup under a northwest flow aloft on Monday, Tuesday, Wednesday and Thursday. This will set the stage for scattered storms to return as a stationary front sets up across our area. This will be the dividing line between dry and cooler air northeast of Alabama and tropical air to our southwest. 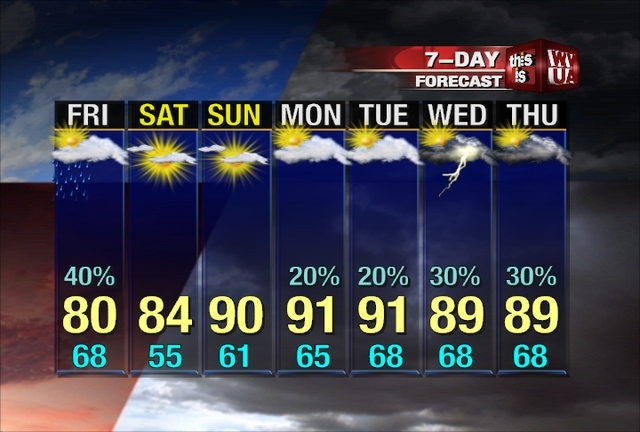 Highs will reach the upper 80s to lower 90s with a risk of scattered storms Monday through Thursday. Here’s a look at radar at about 7:30pm… At this point, the batch of strong to severe storms continue to move to the northeast at 30 mph. 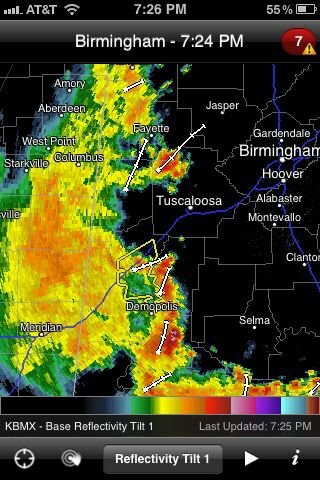 The stronger storms are over east Marengo, Central Hale and northern Tuscaloosa County. Everything else on radar is just light to moderate rain with some lightning and gusty winds. The cell over northern Tuscaloosa County will impact southeast Fayette County and central Walker County over the next hour or two. The line along HWY 69 in Hale and Marengo County will reach Perry and Bibb County by 8pm and continue east through the 8pm hour. Tuscaloosa and Northport areas aren’t seeing much right now. The main activity is going right around the city. Look for the batch of moderate rain and thunder over Sumter, Greene and Pickens County to reach the Tuscaloosa area after 8pm and last through 10pm. The good news is that the severe weather threat is really not turning into much. There could still be a few damaging wind gusts here and there and some hail, but the widespread damaging wind threat is looking low. Stay alert incase your area goes under a severe thunderstorm warning. As of 7:30pm, all warnings have been dropped. The storms that produced some wind damage over Sumter and Greene County has weakened. Once this batch moves east of I-65 around midnight, some additional storms are still possible, but they should stay mainly below severe limits. We’ll watch the radar close tonight incase anything quickly develops. I’ll have lots of updates right here. * AT 646 PM CDT…THE NATIONAL WEATHER SERVICE INDICATED A LINE OF SEVERE THUNDERSTORMS CAPABLE OF PRODUCING DAMAGING WINDS IN EXCESS OF 60 MPH. 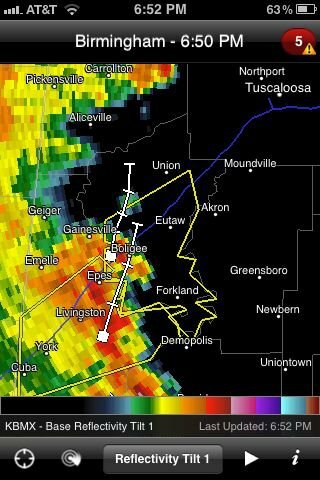 THESE STORMS WERE LOCATED ALONG A LINE EXTENDING FROM EPES TO COATOPA…AND MOVING EAST AT 45 MPH. * LOCATIONS IMPACTED INCLUDE… EUTAW…TISHABEE…BOLIGEE…ALLISON…THORNHILL…FORKLAND… WALDEN QUARTERS AND DUFFYS BEND. THESE STORMS HAVE A HISTORY OF PRODUCING WIND DAMAGE ACROSS SUMTER COUNTY. SEEK SHELTER NOW INSIDE A STURDY STRUCTURE AND STAY AWAY FROM WINDOWS. EPES TO COATOPA...AND MOVING EAST AT 45 MPH. WALDEN QUARTERS AND DUFFYS BEND. Good Thursday evening! We’re watching a line of storms move in from east Mississippi at this hour. The good news is that the storms are weakening a bit. There is a severe thunderstorm warning for Sumter County until 7pm, but other storms are below severe limits at this point. Look for gusty winds and lots of lightning along the entire line. Rainfall rates will also be heavy along the line due to the deep tropical moisture in place now. This could cause some flash flooding issues this evening, so stay aware. 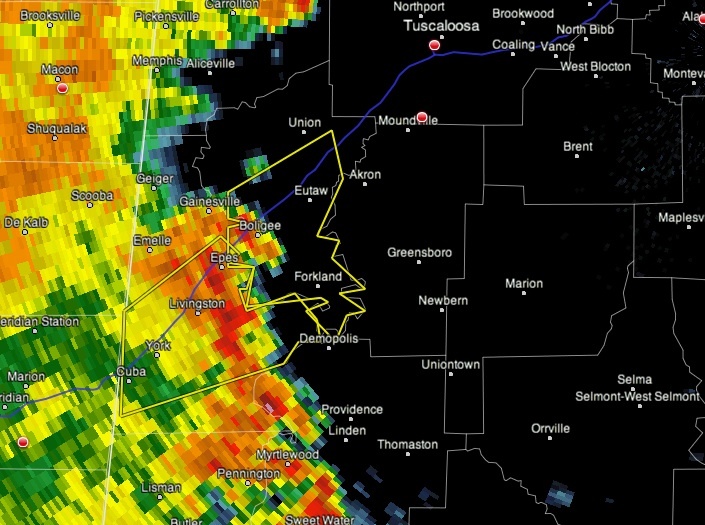 I feel like the threat of severe damaging winds is dropping a bit as the storm moves through west Alabama. There will be some isolated pockets of wind damage, but it’s starting to look like that won’t be a wide-spread event. Stay alert through this evening incase a storm gets out of hand in your area. It sure looks like the threat will move east of our area just after midnight tonight. I’ll have more udpates soon.